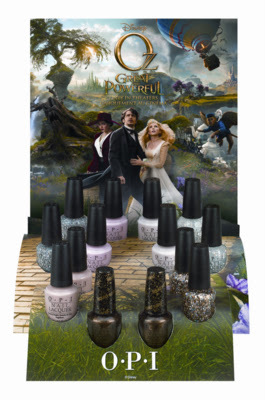 The new opi soft shades collection is here: Opi The Great and Powerful Oz collection. The collection contains 7 shades including a liquid sands polish called “What Wizardry is This“. This polish contains the grainy matte texture and effect. “Lights of Emerald City“ which is a glitter polish. “When Monkeys Fly“ which is a multi color glitter. “Dont Burst My Bubble” an of white shade. An all new beige “Glints of Glinda”. ” Which is Witch” a glittery silver polish, and my favorite shade from the collection a soft pigmented pink “I Theodora You”. I recomend the glitters and “I Theodora You’ for a soft pastel spring manicure.